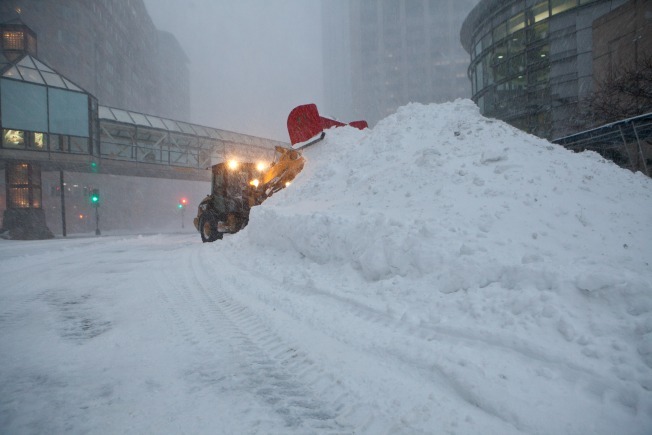 Snow plows work during a blizzard to clear the streets in the Back Bay neighborhood of Boston. Helping Boston shovel out from under feet of snow could score you free Red Sox tickets. Fans who clear out five snow-buried fire hydrants sometime between now and 3 p.m. Wednesday, Feb. 18 could be rewarded with a pair of Sox tickets. Eligible fire hydrants are those located in the city of Boston, including associated neighborhoods. Only In Boston and The Boston Calendar, which partnered with the Sox on the offer, will give out Sox tickets as long as supplies allow. For complete information on how to participate, click here. Meanwhile, some location fire departments are issuing challenges of their own. If you shovel a hydrant in Natick, Massachusetts, and tweet the picture of you and the hydrant to @NatickFire with the hashtag #HydrantChallenge, you could win a Natick Fire Department sweatshirt, and dinner with the firefighters. A similar initiative is going on in Brookline, Massachusetts. And, you could win a T-shirt. Tweet your photos to @BrooklineFD with the hashtag #HydrantChallenge.